Document Signed; Dickinson (John), 1785, Pennsylvania Land Grant. 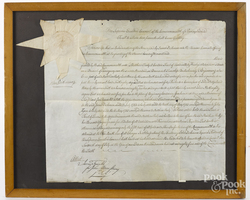 A 1785 Pennsylvania land grant signed by John Dickinson; image credit on full record. A Pennsylvania ink on vellum land grant, dated 1785, signed John Dickinson, 14'' x 16''. Condition: Good. Minor staining and edge losses.